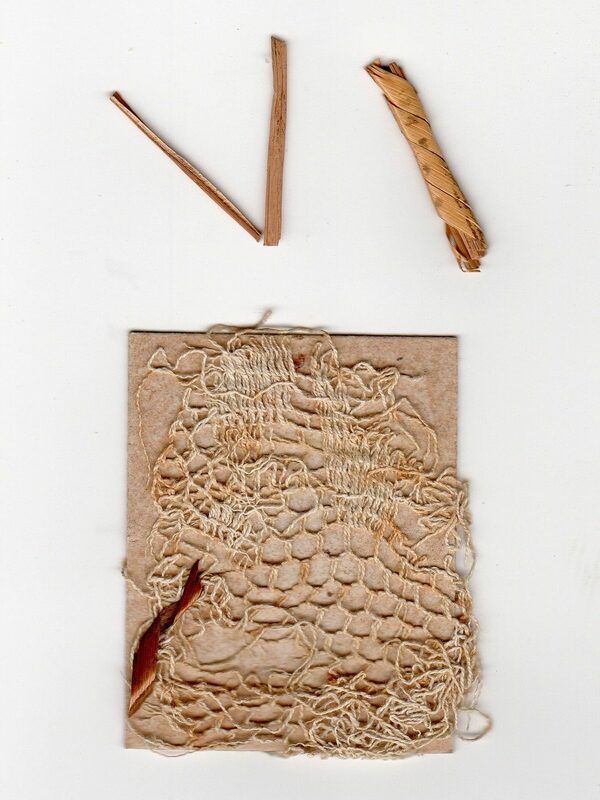 After Abraham Lincoln’s assassination in 1865, items even remotely connected to his death were transformed into historic artifacts. Souvenir hunters started collecting items immediately following his death. Many of these souvenirs were passed down through families to individuals living today. 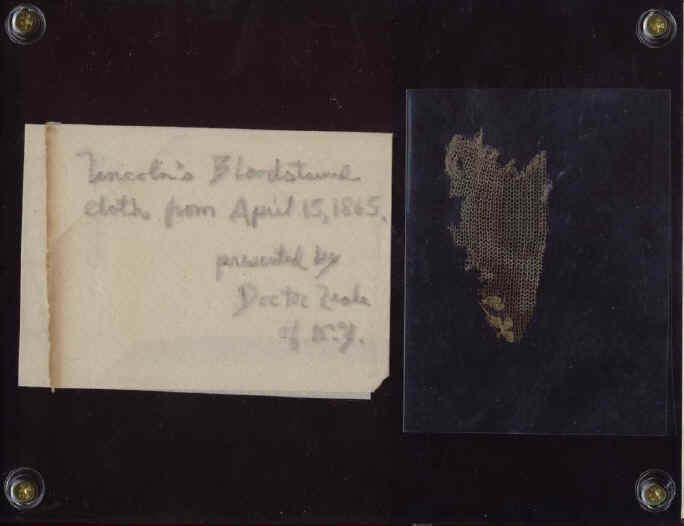 Because of the proliferation of fake items that were manufactured to meet the demand for assassination artifacts after Lincoln’s death, it can be very difficult to authenticate Lincoln-related items. To establish authenticity, a direct link between Lincoln’s assassination to the present day item is necessary. Establishing provenance is essentially a matter of documentation. 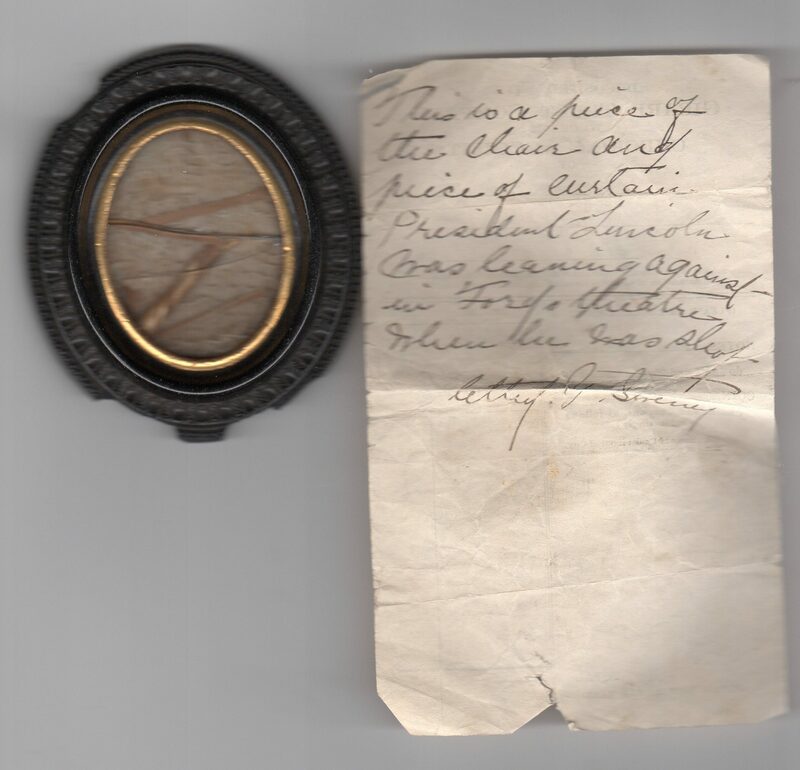 This website is very grateful to the individual who has shared his journey to authenticate a Lincoln relic passed down through his family. 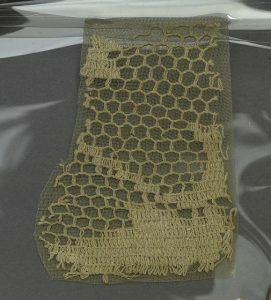 It is believed to have been collected by a soldier assigned to guard Ford’s Theatre immediately following Lincoln’s death. Establishing the provenance is proving to be complicated. Earliest memories of the relic by the present day owner date back to the 1940’s when he recalls his grandmother saying they got the relic from a relative who was an officer guarding Ford’s Theatre after Lincoln was shot. 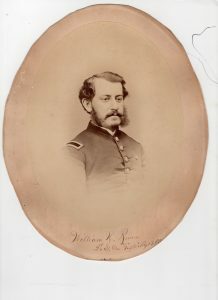 A known relative of the family, Lt. William H. Bower was an officer of the 22nd and later the 24th Regiment of the Veteran Reserve Corp which was stationed to guard Ford’s Theatre immediately following Lincoln’s death. However, the family is also known to be related to the Gatch brothers who were present at the theatre when Lincoln was shot. Dr. Charles Davenport Gatch (1841 – 1870) and his brother Capt. Oliver Cross Gatch of Milford, Ohio. The first physician to attend Lincoln after he was shot at Ford’s Theatre was Dr. Charles Leale, an army physician from New York. 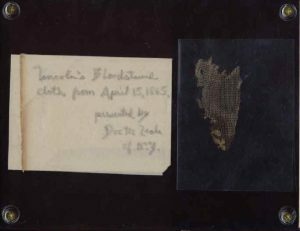 According to DeSalvo, the cloth’s provenance can be traced back to the estate of John Hay, one of Lincoln’s private secretaries. My sincerest appreciation to John DeSalvo for providing images of his relic for this website. The 1865 Brady photograph of Ford’s Theatre was taken by the famous Civil War photographer Mathew Brady the day after Lincoln’s assassination. As news of Lincoln’s death spread, curtains disappeared from the president’s box, cut up and taken by relic seekers. 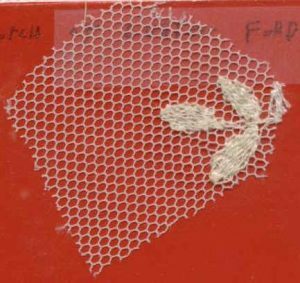 During a reconstruction project at Ford’s Theatre some years ago, an embroidery shop reconstructed the lace curtain pattern based on the Brady photo. 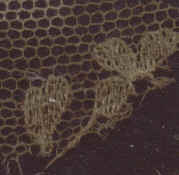 The photo of the reconstructed sample (shown below) was sent to John DeSalvo by the shop owner, Vincent Mesiano. 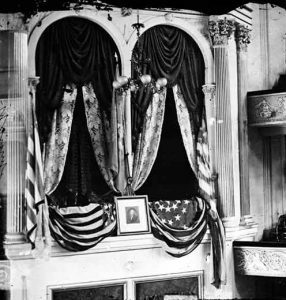 It is interesting to note, as John DeSalvo pointed out, the President’s box which was the box to the right, appears to already be missing the open weave lace under curtain the day after the assassination.